Opening a Bar & Restaurant? Opening a bar and restaurant is an amazing adventure for any up-and-coming entrepreneur – and writing a business plan is one of the very first (and most important!) steps. Wondering how to go about it? No need to look any further. Our Bar & Restaurant business plan sample will help you map out your journey, as well as identifying and addressing any potential pitfalls that could cause problems for your business. Be sure to check out this example to improve your chances of Business Success! Are you looking to write a restaurant business plan? If so, let’s firstly look at The Executive Summary section. Please check it out and feel free to lift any content. We are John and Mary Smith, a father and daughter team, offering years of experience in both business ownership and management, and the hospitality trade. John Smith is currently a Director of an electrical contractors in Washington, and has been in the industry for 30 years. Currently working in the aerospace sector, John delivers the highest standard of workmanship for his clients, and offers a wide range of transferable skills including staff management, decision making, building strong business partnerships, and negotiation skills. John will be supported by his eldest daughter Mary, a confident and outgoing people-persons with years of experience in the bar and restaurant industry. She offers a wealth of knowledge in hospitality and bar management, and would be very much at home running her own bar and restaurant. We will be selling a wide range of soft drinks and alcoholic beverages in partnership with ABC PLC. The wet list will be based on the current ABC listings, and we would also like to expand the wine list in accordance with ABC Code of Practice. The dry menu, which is currently of a very high standard, will be based on local and seasonal produce and created in direct association with the Head Chef. We will also run a number of promotions to push more from our wet and dry menus, and these promotions will also run in accordance with ABC Code of Practice. We will sell to local residents and also people visiting the area. We want to create a warm and friendly atmosphere, and to leave our customers feeling totally satisfied with our service whether they pop in for a pint or a coffee, or stay with us all evening for a meal and drinks. We can only achieve this by employing and developing the right team, and we will focus our efforts on hiring experienced, friendly, professional and enthusiastic staff. From our Head Chef down to our team of waiting staff and bar staff, we will ensure we only hire the best the local area has to offer. In addition to retaining existing regular customers, we recognize the importance of attracting new customers, and we will look into what is currently working for the business, and what isn’t working so well. With this knowledge and information, we can look into promotions and improvements that will encourage more visitors, whether they are locals or passing trade. Please see financial plan for further information. 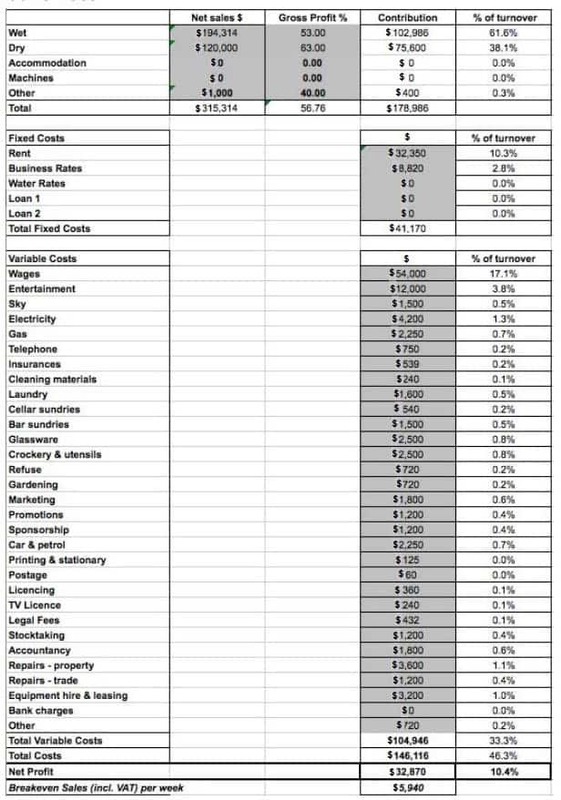 The Company Profile in this restaurant business plan sample is also known as the Company Description. If written well, your potential investors will find it easy to understand your business model, your mission and goals and how it’s going to meet the needs of your target market. 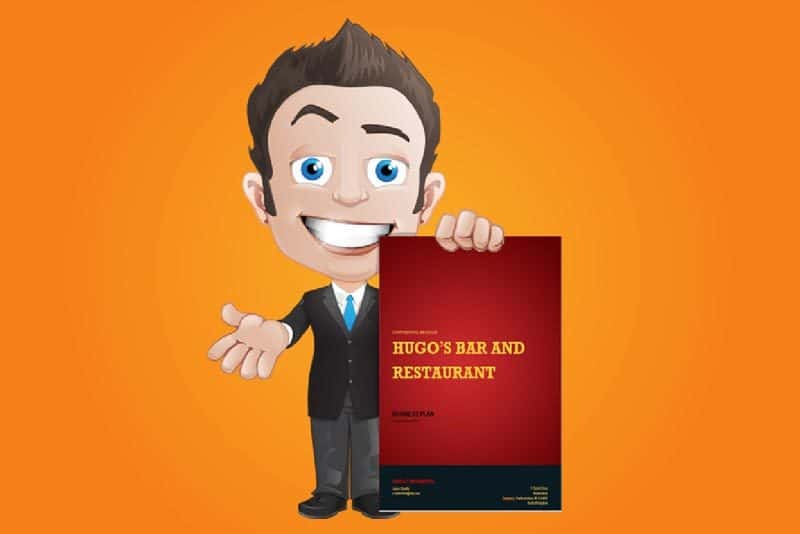 The Hugo’s Bar and Restaurant has been in business for years, and is an established bar and restaurant offering a wide range of beverages and a fine selection of hot and cold meals. This is not a new business, but we would be taking over as new managers of the establishment. The bar and restaurant is owned by ABC PLC and would be offered to us under a five year tenancy, with the opportunity to renew this lease after expiry. The management team consists of John Smith and Mary Smith, a father and daughter team. John Smith has years of experience as a Director for an electrical contractor, and is very experienced in staff management, business management, key decision making, negotiations with suppliers and partners and achieving results. Mary Smith brings a wealth of bar and restaurant and bar management experience, and is keen to continue with the success the bar and restaurant has experienced already, whilst also making significant improvements where necessary. We will look to recruit where required. It is essential that we have a first class Head Chef employed at all times to oversee our menu, and ensure that meals are produced to the very highest standard and that all ingredients are sourced locally where possible. We will employ a mixture of full-time and part-time staff. Our mission is to sell delicious and remarkable food and drinks to our customers. We will ensure that the food and drink we sell meets the highest possible standards of quality, freshness and seasonality and that it is sourced from local producers where possible. We want our customers to experience impeccable service at all times, and we will ensure that our staff demonstrate warmth, efficiency, integrity and knowledge at all times, and that every customer leaves happy. The bar and restaurant has been trading in the same location for a number of years, and offers a wide range of beverages and hot and cold foods to its clientele. Now run by ABC PLC, the establishment has been leased by a number of landlords, and now commands good reviews and a good following in the local region. The Products and Services section in this restaurant business plan example is showcasing the value and quality of their products and services. For any start up bar business plan, it’s important to write down what it is that sets you apart from your competitors and the benefits of your business. The Hugo’s Bar and Restaurant is a family bar and restaurant offering a warm welcome, a wide selection of beverages, and an excellent menu. It is very popular with locals and has received very good reviews on TripAdvisor. The wet list features ABC fine cask beers, wines, spirits, cocktails, soft drinks and a coffee menu. We would also be interested in adding more wines to the menu, perhaps featuring a wine of the month, or wines from a particular region each month to keep the menu interesting. A dedicated kids menu. We could offer discounted kids meals one afternoon a week to encourage parents to visit us with their children after school. A dedicated gluten-free menu. There were a few comments on TripAdvisor about there not being a good gluten free selection. This is becoming more important to clientele. More theme nights such as steak & wine nights. We would also look into doing beer & cheese nights. This is something that has just started to take off, and would be a great way to introduce people to the cask beers on offer alongside local cheeses. Events such as coffee mornings welcoming people from the community, especially new people looking for a place to meet with locals, or get to know us better. We would also look into adding or updating fruit machines and a jukebox, as well as increasing food service hours, and perhaps looking into serving a small breakfast menu. These bar and restaurants have good reviews. Happy Restaurant is famed for its real ales and homemade pork pies. The Arms is popular with sports crowds and offers good beer and a welcoming, busy atmosphere. Washington Arms offers a good selection of beers, and cheap homestyle food. We want to be able to cater to more families looking for excellent food in a warm and welcoming atmosphere. We want to offer a busy and lively atmosphere in the evenings and to attract locals and passing trade. We also feel our dry menu offers so much more than other offerings in the local area, and we really want to focus on increasing profits in this area, and to look into ways to attract our customers to have a meal with us. We would love to develop the products, services and events on offer, and to do this in line with the ABC Code of Practice. As the saying goes ‘if it ain’t broke don’t fix it’ and so we would look at the aspects of the business that are working well, and only make improvements where necessary. We also want to stay away from adding too many gimmicks as this can be a bar and restaurant’s downfall. We believe clientele like regular events so they know what is happening and when, and this works very well with the XYZ brand which offers Curry Clubs, Lunch Clubs and other options on set days of the week. We also want to appeal more to families during the day. One idea we have is to add a marquee outside, and to build a pizza oven so that we can hold kids’ pizza parties and other events outside. Parents are always looking for something different for their kids to do, and this could be a very lucrative revenue stream for the bar and restaurant. Parents may also stay to have a meal or drinks while the little ones enjoy the party. We may also look into offer a set kids menu as seen in other establishments. Children could choose a main meal, dessert and a drink for around $4.95, and also be given coloring pencils and a picture to color in. This not only keeps the kids entertained, but also encourages adults to stay longer and purchase more items from wet and dry menus. We would also promote our birthday parties on the back of the coloring in page. All wet products will be sourced and supplied by ABC PLC as per our agreement with the brewery. Equipment such as cellar cooling and drinks dispensers are maintained by ABC. We would look to secure good deals for local produce for our dry menu, and will leave this responsibility to our Head Chef. Pathway and Lease Agreements are fully tied for all beers, ciders, stout, wines, spirits, soft drinks, packaged alcoholic drinks and gaming machines, including Amusement with Prize Machines (AWP), Skill with Prize Machines (SWP), pool tables and video/LCD based non-payout leisure machines. Not applicable to this business. This section is one of the most important aspects of your Bar & Restaurant marketing plan. Our target market will consist of local customers already regulars at the establishment, new local customers, people visiting the area, and passing trade. The Hugo’s Bar and Restaurant already has a good reputation in the area for a good atmosphere and great food, and we certainly would not want to change that! However, we do believe there is room for improvement and that these improvements would attract new customer streams to the bar and restaurant. If we could extend the restaurant opening hours for example, we could improve profits across the wet and dry menus, and also upsell items such as good wines. We would also want to welcome more children and parents to the bar and restaurant, and will look into ways we can do this. The Hugo’s Bar and Restaurant offers some amazing attributes to the area. Its warm and welcoming atmosphere and good food are very well documented on TripAdvisor. We will offer a wide range of products under one roof including alcohol, soft drinks, coffee and good food. People can come to us in the afternoon for drinks and stay with us through dinner and up until closing time if they wish. We want to encourage this kind of home from home experience and encourage people to enjoy as many of our products and services as possible. However, there is room for improvement. There are a number of negative comments on TripAdvisor regarding the limited range of food on offer for children, and there have also been misunderstandings in the past about gluten-free options. We would do more to ensure our customers are catered to and made to feel totally comfortable in our surroundings and with our menu. We would also look at adding services that cannot be found elsewhere. For example, our plan is to offer kids’ parties outside in a marquee. By adding a pizza oven outdoors, we can capture a section of the market that is growing with a relatively cost-effective idea. This will also attract more wet menu sales from parents and carers who want to stay with us while the party is going on. The great American night out has always featured the bar and restaurant. Whether it is at the start of the night for a few drinks before dinner or going on to a nightclub, or patrons spend their entire night in the same establishment, this timeless trend shows no sign in stopping or even slowing down. However, with more bar and restaurants springing up, and more bar and restaurants using innovative ways to attract patrons, we would need to stay on our toes. By offering a mix of traditional bar and restaurant fayre and services, and also looking at new ways of attracting customers, we will remain competitive and maintain the already good reputation. Craft beers and cask ales are becoming more and more popular. People are open to trying new experiences, and would look at ways we can promote beer sales with special events. Beer and cheese evenings are starting to gain popularity with patrons being offered a cheeseboard and smaller taster glasses of beer. This is just one idea, but an example of how important it is to keep up to date with market needs and trends. We may also look into ways in which we could encourage people to have their “big night in” at the bar and restaurant instead of at home. People settle down at home for shows such as X-Factor, Americas Got Talent, and other big TV events. We could possibly create a living room atmosphere and encourage people to come to us instead. This sort of event could get people talking to each other, enjoying themselves in our establishment, and ultimately ordering more drinks. During the past decade, a series of legislative, social and economic trends have conspired to squeeze industry revenue and profit margins, forcing many bar and restaurants out of business. Already reeling from the ban on smoking in bar and restaurant places, patronage and industry revenue have been battered by rising beer duty, declining alcohol consumption, competition from low supermarket alcohol prices and the prolonged economic downturn. Whilst it can be difficult for new bar and restaurants to enter the market, established bar and restaurants with regular visitors, a good reputation and willing to keep up with the latest trends and customer demands, can continue to thrive. This is why it is so important for us to review where the Hugo’s Bar and Restaurant is doing well, and to focus our efforts on areas that need improving or to introduce new events or services that would bring in new sustainable revenue streams. We will be working in the hospitality industry, offering good food and drinks to our customers in a warm, friendly and welcoming atmosphere. Our services and products will be sold directly to customers within our establishment, and promoted across a number of different channels. Customers often make their buying decisions based on price and personal preference. In addition to drinks purchased direct from the bar, we will also offer drinks within our restaurant, and this is where we may have the best opportunity to push some of our higher priced items such as wines and also pre-dinner cocktails. Reputation is also important, and the ABC name is well known amongst cask ale lovers. Our key customers will consist of people of all age groups, from 0-100 years old. We want to promote a real family-friendly atmosphere, and to encourage people of all ages, all walks of life, and all areas to come to our bar and restaurant. We want to promote a real community spirit that unites people, starts conversations, offers customers a great day out or a memorable night out, and which also encourages customers to share their experience with others. 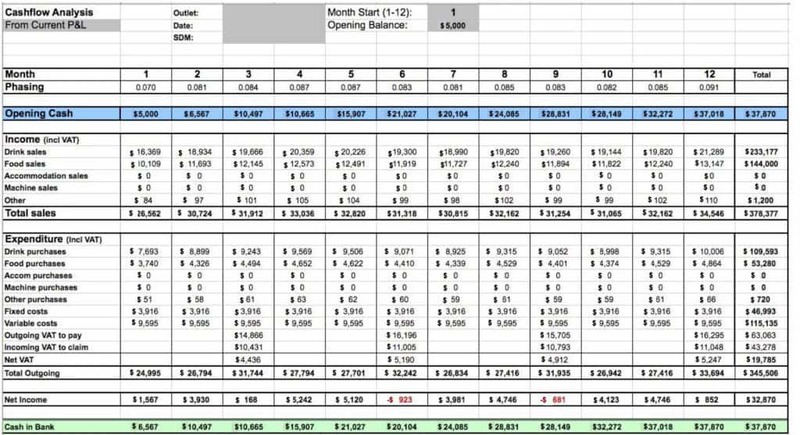 Let’s look at this example for a restaurant business plan. Define a marketing strategy within your business plan to highlight your expertise and emphasize what makes your business concept compelling. There is a need for a good local bar and restaurant in every town, somewhere people can come together to share good times, celebrate, relax at the end of a long day and generally socialize with friends, family and other locals. The Hugo’s Bar and Restaurant is a small bar and restaurant, but is very big on character and reputation, and we would want to keep it that way. We believe there is room in the market for many different establishments, but we do need to ensure that we stand out. Through good advertising locally and nationally, we can ensure our name stays on the map, and that we maintain the reputation the bar and restaurant has achieved already. Good quality cask beers, a wide range of beverages, excellent food, a welcoming atmosphere, exciting promotions, regular events and a family feel are all qualities we feel are important to the bar and restaurant and its customers. Our marketing plan would include improving the website, using social media channels more effectively, using print advertising for our promotions and events and also encouraging word of mouth recommendations and online reviews. We feel there is a lot of room for improvement where marketing is concerned. For example, the Twitter feed has not been updated since February 2nd. Please see the latest ABC wet list pricing. The bar and restaurant currently offers a set menu for its guests at lunchtime, and an à la carte menu during the evening. These are all priced at very competitive rates. We would like to offer our customers discounts, especially regular customers. We will offer these discounts through a discount card, and also through fun promotions on our social media channels. We intend to use digital marketing and print marketing to its full potential. Through regular updates to Twitter, Facebook and our website, we can start to attract more attention, and ultimately attract more people through the door. There is currently a website, but we feel it is very lacking in terms of up to date information. For example, there is a sample food menu listed, but we feel there could be more details here and some good quality photos to show potential customers how good our food is. There are also no event listings or any information about promotions or other messages that could attract customers. We would also like to attract more customers celebrating a special event. For example, we could give the birthday boy or girl a free pint or glass of prosecco, or a free dessert. We want the Hugo’s Bar and Restaurant to be their first choice whenever they have something special to celebrate. We would like to use social media to advertise promotions. There will be regular quiet times during the week, and we would like to encourage more footfall by offering discounts through Twitter and Facebook. For example, we can give a 10-15% discount to any customer that quotes a phrase we have posted on our social media channels. We also want to promote the Hugo’s Bar and Restaurant as a true community bar and restaurant, and we will look into charity promotions and other events where we can put something good back into the community. Whether it is giving a local charity somewhere to hold an event, or holding a special lunch club for elderly local residents, we want to portray a caring and welcoming image. We will sell directly through the bar and restaurant. We will also offer birthday party packages. We would be taking over an already established business. Before taking over, we would want to have a set plan of action in place for any improvements we would like to make. For example, we would like to have seasonal lunch and dinner menus devised in advance so that we can publish these on our website and through our social media channels. We would also like to have set out our regular events and promotions and to have advertising arranged for each of these events so that we can get the word out in advance of each event taking place. It is also important that we are accepted as the new management team, and therefore any changes we make will need to be handled carefully and in a sympathetic way. We want to listen to our customers, and through face to face conversation and activity on our social media accounts, we can obtain feedback on what our customers would like to see. This feedback will also have an impact on our milestones. Training of key members of staff is also essential and we would work closely with ABC to establish a training schedule in accordance with their Code of Practice. Both John and Mary already have a Personal License in place. In summary, we would look at employng good quality staff including a Head Chef, increasing food availability times, improving sales and profits and establishing ourselves as one of the leading bar and restaurants in the community. The Hugo’s Bar and Restaurant is in a very strong position as a popular bar and restaurant in the heart of the community, and is well established. It is especially well known for its excellent food and drink menus, and for its large garden during the summer months. The exterior of the bar and restaurant is attractive and welcoming, and offers a clean and modern look and good kerb appeal. There are also good parking facilities. The bar and restaurant is also known for its excellent staff and service, and this is apparent on TripAdvisor and other review sites. We would work hard to maintain this level of service, and to make improvements where possible. As with any business, there is always room for improvement. We feel there are a number of areas that we could work on immediately, and which would take minimal focused effort to achieve and improve. We would first turn our attention to the food menus, offering a good set price kids menu, and also gluten-free options on a separate menu. We would also review gluten-free food prep in the kitchen, ensuring we have a separate fryer for chips and other foods that need to be cooked separately. Food service times are currently too short, and we feel the bar and restaurant is missing out on profits during these times. The bar and restaurant is currently closed on Monday, and this is an entire day where the bar and restaurant is missing out on local trade and trade from people visiting the area. The patio area is not currently used to its full potential, and we would like to improve this area to make it more appealing and more suitable for a range of uses. Social media channels are not being updated. The last Twitter update was almost six months ago, and this is a big area we would like to address. The website also needs attention. There are many opportunities for improvement. In addition to the improvements we have already listed, we would like to focus on seasonal opportunities such as Christmas, New Year and Mother’s Day and advertise these events and promotions well so that we achieve maximum covers in the restaurant and excellent profits from our wet menu. There is a real opportunity for us to appeal to more groups of customers, and to open up new revenue streams. For example, our aim is to have at least one kid’s birthday party booked every weekend, and to have more parents popping with their kids after school. There are also opportunities for us to improve our food menu, to make it more available during the week, and to publicise our menu and any special offers across our website and social media. We also want to welcome our more elderly residents, and give them somewhere to visit on a weekly or monthly basis for a warm meal and a friendly atmosphere. It is essential that we maintain the Hugo’s Bar and Restaurant’s already excellent reputation, and that we make improvements carefully and in the right way. One bad TripAdvisor review could be very damaging, so we will do everything in our power to attract the best reviews and word of mouth recommendations. Any failures in service will be dealt with immediately, and any poor reviews replied to and addressed in the best way possible, offering compensation where necessary. We also need to ensure we keep an eye on our competition and what they are doing. Our tie-in with ABC is also critical to our operations, and so we would ensure that we work in accordance with the Code of Practice at all times. Staff retention is extremely important to the establishment, especially in terms of more skilled staff such as the Head Chef. We would ensure we offer an attractive remuneration package, and that we keep our team motivated to the point where they wouldn’t want to work anywhere else. We are competing against a number of similar establishments in the local area. The most popular bar and restaurants in the region offer excellent services, but we are in a very strong position to compete. For example, some are more well known for a lively sports crowd, and well-placed near to public transport links where there is good footfall from visitors. We want to be the warm, friendly and inviting bar and restaurant where everybody is welcome. We offer a range of good quality beverages backed by the outstanding ABC brand, and we offer a fresh, seasonal and local menu cooked and presented to perfection. Customer service will also be extremely high, and customers will want to come back to us time and time again. We believe we can stand out with our reputation, our promotional activities and also our innovative options such as kids’ pizza parties, beer and cheese nights and other events that are not available elsewhere. In addition to our website and social media channels, we will also advertise in local newspapers, outside the bar and restaurant, at point of sale and on our restaurant and bar tables. We will track the success of our promotional activity through social media promotions, and also through print promotions. For example, some promotions may require a special code to be announced at the time of ordering, or for a leaflet to be presented to gain a discount. Our restaurant bookings will be taken in person, over the phone and through our website. All other products and services will be sold directly. Whilst all sales will be largely led by what the customer wants to order at the time, we will encourage more sales through our promotions and also through clever upselling by our staff. For example, asking customers if they would like to see the wine list over lunch, or asking them if they would like any bar snacks with their order are all ways we can gently make suggestions. We may look into financial rewards for our staff depending on which products we can upsell and how. Our greatest strategic alliance will be with ABC PLC, and we would ensure we work closely with the company at all times to ensure we are complying with their Code of Practice, and to raise any concerns we may have early on. Are you going to start up your own bar & restaurant or have you recently written a business plan? We’d love to know what you thought about our bar & restaurant business plan example.